After facing disappointment in the hands of As Roma last weekend, Napoli run rampant in the midweek as Walter Mazzarri’s team completely demolished Genoa 6-1 at San Paolo. Meanwhile, at Olympico an uninspiring performance from Lazio earned them only a point against Chievo, something that should be cherished by Edy Reja’s men as they were outplayed by their opponent for the most part of the match. 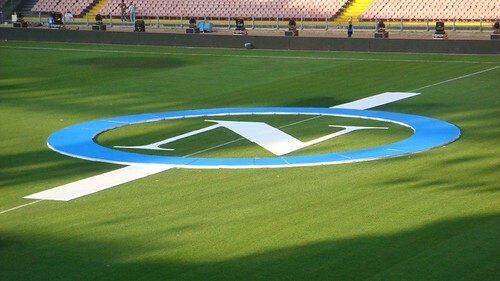 Six Star Napoli Demolished Genoa. Napoli players already looking really eager to redeem their previous defeat against Roma at San Paolo and apparently lady luck was not going away from Mazzarri’s team as Edinson Cavani opened the scoring only after 12 minutes. Four minutes later, Marek Hamsik shown his class by netting the home team’s second goal in the match after a fine classic counter attacking move by the Partenopei, which is simply to quick for Genoa’s back line. Cavani added his tally again in the 24th minute as the striker once again managed to sprung the offside trap and eventually chipped the ball pass Sebastian Frey on Genoa’s goal, to give his side a 3-0 lead. The visitor did managed to pull a goal back though, as few minutes after the Uruguayan star grabbed his double, Jorquera scored a wonderful goal for Alberto Malesani’s team. However, Goran Pandev restored Napoli’s three goals advantage with a fine drilled shot which once again came from a fine counter attack. Leading 4-1 in the first half, Napoli didn’t simply rest their laurels in the second period as Mazzarri’s boys added two more goals from Walter Gargano’s long range shot and followed by a similar kind of effort from Juan Zuniga. The result obviously gave the Partenopei fans some delight just before the Serie A went into a short break and re-start again sometime in early January. Meanwhile, Lazio failed to get themselves closer with the top three teams as they picked up another draw at home and this time they can consider themselves a little bit lucky in having it since their opponent, Chievo, played much better. Eying to give a present for their fans before the short break, Lazio tried to take the game on their hands but apparently things didn’t really happened the way it was planned for the home team. The Flying Donkey, who were playing without any sort of pressure managed to dominate the match and created tons of great goal scoring chances, notably from Alberto Paloschi and Sergio Pellisier. The Capital club should really be thanking their keeper, Albano Bizzarri, as he was practically the one who managed to keep Lazio in the match after making several wonderful saves. Lazio tried to change things a bit in the second period and did create a bit more chances compared to their completely dull first half, but still it was the away team that looked more dangerous. Having Bizzarri continuing to be the Biancocelesti’s best performer on the pitch pretty much said everything about Edy Reja’s side performance, who eventually got booed by their fans after the match end in a 0-0 draw.